Extreme Tactical Dynamics introduces a powerful but small 1.5” diameter, 9-watt light that can be hidden from sight in the head or tail light of your vehicle or be mounted on the surface with the 2.5” x 2” frame. 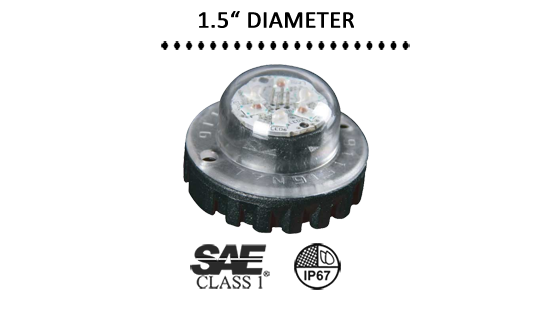 3 Generation IV LEDs produce intensely, blinding output in 18 flash patterns with pattern memory; it comes in 5 solid colored lights with either black or chrome mounting frames, both of your choice. The light is hardwired to an existing light or siren system by using the 8” power cord and can be synchronized with up to 19 other units; it can also be made to alternate with them. A circuit board flasher is built into the ANT 6-3. These emergency strobe lights are waterproof and come with a rubber gasket that seals the Hideaway securely to the exterior. Clear polycarbonate lenses that won’t shatter or crack and are impact resistant make it possible to install the strobe low on your emergency vehicle. Using an EVT professional is always best when you can, but if you do decide on a DIY project be sure to follow the steps listed in the Installation Guide that is found in the Knowledge Base section of ETD’s website. Always read ALL of the directions first before starting. Extreme Tactical Dynamics has a remarkable, specialized customer service team. Check out the About Us section to see who to contact directly if a problem does arise; one of us will serve you promptly and efficiently!